Copyright © 2019 EspressoID, Inc.
Purchase includes one year of online support and program updates. Renew online support and program updates for one additional year. 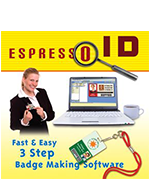 EspressoID is the best choice for an organization needing a low cost, user friendly photo ID card software. Compare our unlimited features to other programs. Unlike our competitors we have no field, template or cardholder limitations and no hidden charges. EspressoID offers a great value for anyone. Makes creating professional looking ID cards a snap! EspressoID® is licensed for use on one computer. The license includes one year of online support and program updates. An internet connection is required for product activation and program updates. If you are a current EspressoID customer needing help, please use the Report Problem feature in EspressoID's Help menu. Requesting help directly from EspressoID will provide us with helpful information about your computer that will enable us to help you faster.